I like to use lightweight tools whenever possible as there is no point in running IceWM if one uses KDE or GNOME applications for everyday tasks. Because my memory is far from perfect, I like my computer to remind me about the projects I have to work on and about classes I have to attend. There are some obvious choices for this kind of task if one uses KDE or GNOME. For exapmle, Korganizer would be great tool for keeping your calendar and to do lists. 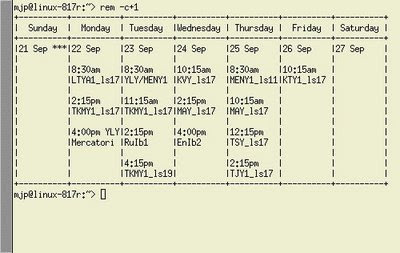 I decided to use a command line tool, remind, for storing all the information about my meetings, classes, and deadlines. These are reminders for a meeting on the 22nd of September at 16:00 and three reminders for my classes on tuesdays. It is possible to use much more sophisticated reminders that have rules for deciding the date of some action. You can also set the remind to warn you in advance, before the actual date of the reminder, but I like to keep my reminders simple. 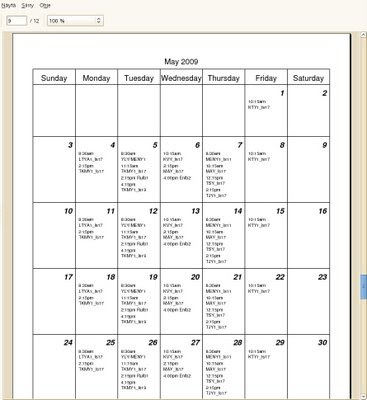 If a weekly calendar is not enough for you, you might consider printing out a PostScript calendar of your reminders for the next twelve months with remind -p12 .reminders |rem2ps >remind.ps. There are many good sites about using remind in an efficient way. Let your computer remind you of your meetings, classes and deadlines. It will help you to get things done!